You are here: Home / Blog Post / Part 2: Ah HA! About those outlandish auction ideas? I’ve got photos. A friendly greeting in the school drop-off lane. Not so long ago (like two weeks ago) I blogged about how dressing up to promote your charity auction could rank as one of those top concepts … especially when it comes to school auction ideas. That’s right. I have honest-to-goodness photographs proving that some of my fabulous school auction clients are doing just that. They are having fun, hamming it up, promoting their school auction … by dressing up. Voici. Take a look at these shots. 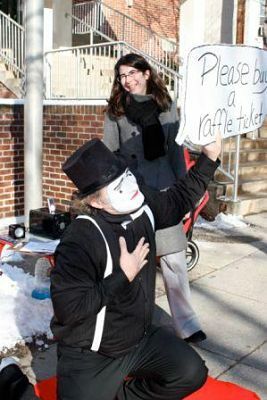 Here’s someone clearly in a playful mood promoting the school auction. No doubt, he’s bringing smiles to others as they pulled up to drop off their kid for a day of school. 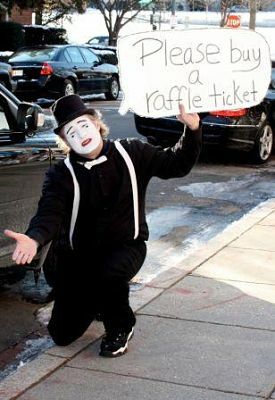 If this mime met me at the school while I was dropping off my child, I would buy a raffle ticket – even if I had ALREADY bought one. I love that he took the time to create a simple costume and – most importantly – took an hour out of his day to “work” the drop-off area in front of the school to promote the auction and specifically the raffle. Who in your school might have fun doing this? Who is the man behind the face paint? He was the chairperson of the Parents Association Committee. 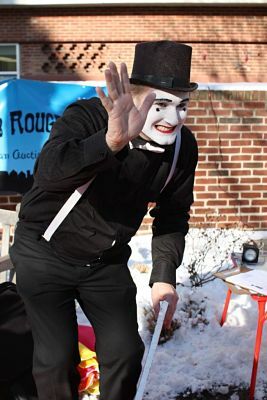 He decided to dress up in the spirit of the Moulin Rouge school auction theme to bring awareness of the fundraiser to the parents. Could you say no to him? Many couldn’t. His gimmick was the buzz among the parents. I love that, Jessika! It heightens the anticipation of everyone. Thanks for sharing.